Following its agreement with German manufacturer Neander Shark for exclusive global distribution of the game-changing Dtorque 111 twin-cylinder 50 hp diesel outboard engine, YANMAR MARINE INTERNATIONAL (YMI announced the official launch of this exciting new propulsion product on Sept 28th & 29th in Almere, The Netherlands. Where Distributors & Press were invited. The compact Dtorque 111 is designed to revolutionize the small workboat market where its expected lifespan of well over 10,000 hours at least doubles that of any comparable outboard gasoline engine. The Dtorque 111 offers a remarkably smooth and quiet diesel engine, delivering 50 hp at the propeller with a stunning torque output of 111 Nm at just 2,500 rpm. This is considerably better than the latest 70 hp 4-stroke gasoline models and more than enough to quickly accelerate most small craft onto the plane with plenty of low-down lugging power for heavy displacement duty. To create the Dtorque 111 the German developer and manufacturer Neander deconstructed conventional small-diesel engineering to first principles. The result is a two-cylinder common-rail turbo charged diesel engine, using a unique system of dual counter-rotating crankshafts in an aluminum block, which dramatically reduces the vibration levels that a conventional small two-cylinder diesel engine would normally generate. This technology with a patented ‘Spaceball’ design not only achieves less vibration but also less noise, lighter boat handling and less stress on the engine. The Dtorque 111 is the world’s smallest diesel engine with common-rail fuel injection. This enables it to deliver an impressive performance with class-leading fuel economy and exhaust emissions that fall well within the latest EU RCD 2 limits. 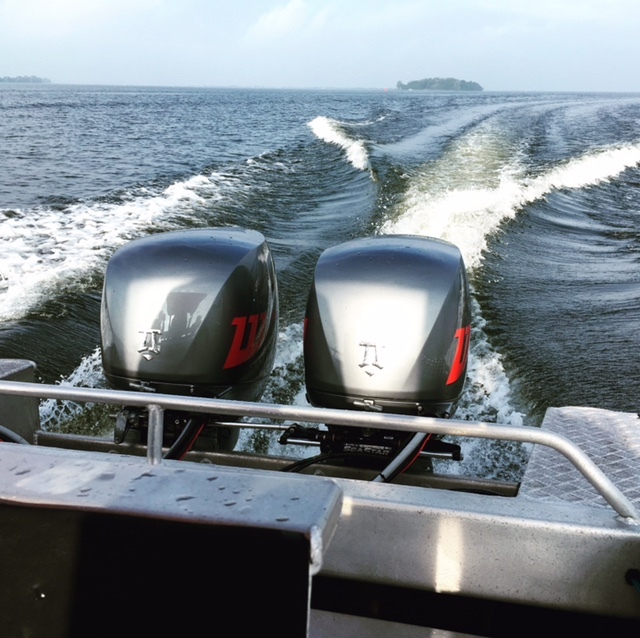 At full throttle and lading it typically burns under 12 litres of fuel per hour 2 times less than most 70 hp gasoline outboards of similar performance. The Dtorque 111 ensures fewer refuelling stops and lower running costs. The Dtorque 111 turbo diesel outboard is SOLAS (MOB) certified and now in full production with customer deliveries in the last quarter of 2017. Through its Distribution agreement with Yanmar Marine International (YMI), Seascape Marine are now able to offer the Neander Shark DTorque turbo diesel outboard. With over 60 years’ experience – Seascape Marine Services has the skills and capability to overhaul, maintain and service all major diesel engine manufactures products (main engine & Auxiliary) including the DTorque, as well as turbochargers and reduction gearboxes.